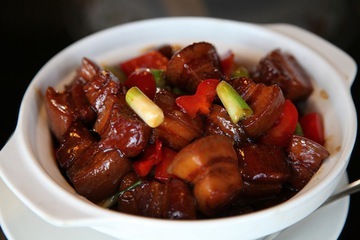 Red-braised pork is a dish that in Hunan is inseparably bound up with the memory of Chairman Mao: many restaurants cal it “The Mao family’s red-braised pork.” Mao Zedong loved it, ate it frequently, and is said to have insisted his Huananese chefs cook it for him in Beijing. It’s a robust concoction, best eaten with a plain steamed rice and simple stir-fried vegetables, but the sweet, aromatic chunks of meat are irresistible and it’s always a favorite at my London dinner parties. In keeping with traditional Chinese gastronomy, which seeks to make a medical virtue out of every dietary predilection, the people of Mao’s home village, Shaoshan, recommend a red-braised pork as a health food: “Men eat it to build their brains,” Chairman Mao’s nephew Mao Anping assured me when I met him there a few years ago, “and ladies to make themselves more beautiful”. His friend and neighbor, the Shaoshan communist party secretary, told me he ate two bowlfuls a day to keep his intellect in shape. 1. Plunge the pork belly into a pan of boiling water and simmer for 3-4 minutes until partially cooked. Remove, and, when cool enough to handle, cut into bite-size chunks. 2. Heat the oil and sugar in a wok over a gentle flame until the sugar melts, then raise the heat and stir until the melted sugar turns a rich caramel brown. Add the pork and splash in the Shaoxing wine.